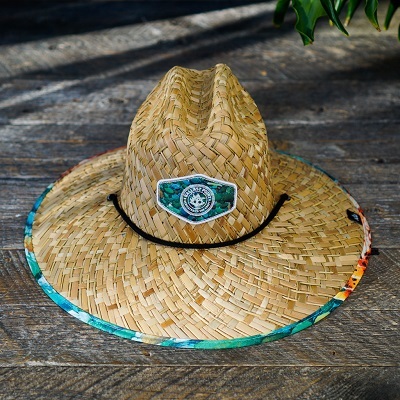 Just in time for the Spring weather in San Diego, check out this Sculpin inspired straw hat made by Hemlock. Made from 100% Straw with a 100% Polyester fabric under cover that not only sports our own Paul Elder’s iconic Sculpin art, but it is also UPF 50+ rated. Enjoy this one size fits all shade creating art work covered hat when you are relaxing on the beach, fishing, hiking or just enjoying some time outside in the sun. From Anonymous of Riverside , California on 8/11/2018 . This hat is so well made and looks great! It was a present for my bf who loves your beer and he is so happy with it. Thanks! From Anonymous of Whittier, California on 8/5/2018 . Great product! Fast and efficient shipping.! From Anonymous of Las vegas, Nevada on 5/26/2018 . Great hat well made will help with this Vegas heat this summer..